Thomas, Wayne P. and Collier, Virginia P.
Dual Language Education of New Mexico Fuente Press, Albuquerque. Dual Language Instruction. 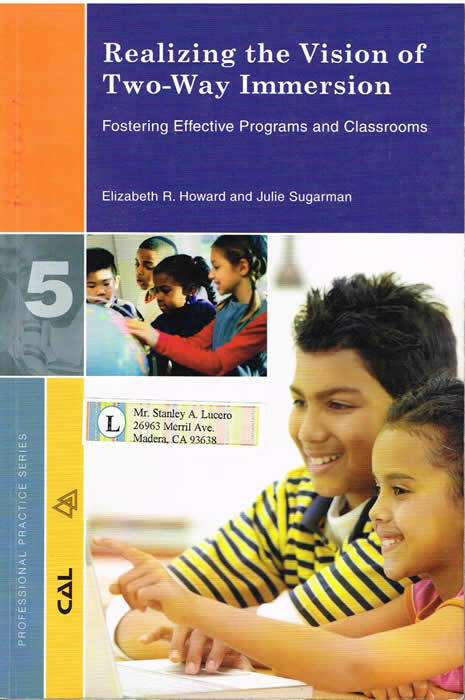 A Handbook for Enriched Education. Cloud, Nancy; Genesee, Fred; and Hamayan, Else. 2000. Heinle & Heinle, a division of Thomson Learning, Inc., Boston. Educating English Learners For a Transformed World. Collier, Virginia P. and Thomas, Wayne P., 2009. Language Experience Approach to Reading (and Writing). LEA for ESL. Dixon, Carol N. and Nessel, Denise, 1983. The Inner World of the Immigrant Child. St. Martin's Press, New York. Velazquez Press, El Monte, CA. La información en esta pájina representa recursos para padres y maestros. These are links to webpages and documents related to Bilingual Education and Bilingual Special Education. I have included them as resources for Bilingual Teachers and parents who want their children to become bilingual. I have dedicated my teaching career to helping students become bilingual, biliterate, bicultural, and bicognitive so that they could reach the highest levels of bilingualism and academic proficiencies. I highly recommend the two-way bilingual immersion [dual language] and heritage immersion programs. Purchase and view the video "Speaking in Tongues" to learn more about 4 students in dual language programs in San Francisco. For those of you who live in the San Joaquin Valley, Yolanda and I would be honored to meet with you and your colleagues to view the Speaking in Tongues video and to discuss the Seal of Biliteracy award. Proposition 227: Where Do We Go From Here?